Savvy shoppers might recognize the Homall name because this company makes popular gaming chairs and other home furnishings. Their recliner fits into the zero gravity chair category because it reclines more than 130 degrees. It allows the owner to have the same level of comfort in their living room as they do outdoors on their patio lounger. And its classy black leather appearance would look great in a home office, too. The smooth surface of the recliner consists of PU leather, also known as bi-cast leather. It’s popular in the furniture industry because it’s durable and easier to clean than full-grain leather. PU leather consists of a split leather backing coated with a layer of polyurethane. In this manner, the material retains a “like new” appearance for a long time. Another advantage to PU leather is that it doesn’t typically have a plastic smell. Any noticeable odor should dissipate within a few days once the chair is unpacked and assembled. Underneath the leather-like surface is high-density sponge that springs back into shape easily. It pads the seat, backrest, leg rest, and headrest, too. Then the curved armrests have a thoughtful design. They are also padded, which is convenient since they are integral to the chair’s function. With a gentle push on the arms, the chair reclines backward smoothly. The reclining action is made possible by the 3mm-thick sturdy steel frame that supports up to 265 pounds. 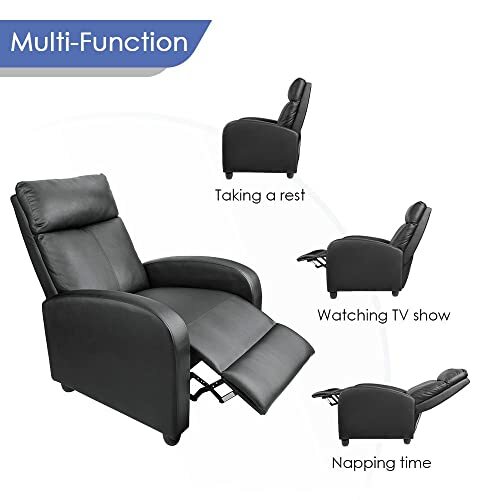 Many customers report that the Homall Single Recliner Chair is straightforward to use. They don’t need to exert much force to recline the chair or push it back upright. Although there is no lever to lock it into place, the recliner stays in position until the user pushes on the arms and leg rest. In fact, since there are no preset points, the chair gives the user complete freedom of movement. The recliner also comes with non-marring rubber feet. They protect laminate and hardwood floors from scratches and marks. The only downside to the Homall recliner is that it requires assembly. Owners report that it’s not difficult to put together since there are only two pieces. And the company offers free exchanges (or a refund) in case there are missing parts or any other problems. Now that we’ve discussed some of the comfortable characteristics of the recliner let’s take a look at its dimensions. To begin, the seat is 17.7 inches off the ground. Compare that to the average height of a dining room chair which is 18 inches. Next, the seat cushion is 22.1 inches deep and 19.7 inches wide. That is a little roomier than an airline seat. And when the chair is fully open, it measures 62.6 inches from the tip of the footrest to the top of the headrest. This much recline is rarely available even in first-class. As you can imagine, a person who buys their clothing in the big and tall store might feel that this recliner is too small. On the other hand, the chair’s compact size allows it to fit into spaces that wouldn’t accommodate a full-size recliner. Compact size allows it to fit where a full-size recliner cannot. Shoppers on the lookout for a budget-friendly living room recliner may fall in love with this zero gravity chair. It’s well-padded for comfort and reclines effortlessly into any position. The fact that it has a leather-like material that stands up to spills and wear is a bonus. Fans of zero gravity patio loungers will appreciate having relief for their back pain with this recliner inside their living room. Homall Single Recliner Chair Review is attractive, cozy, and assembles in minutes.